As we advance into the early days of March, it's fairly safe to announce that winter is officially on its last legs. The Polar Vortexes and dramatic dips in temperature will soon be nothing short of a distant memory. The Honeywell Store played a rather large part this winter with an online selection of portable heaters, furnace air filters and thermostats that demonstrated both flexibility and efficiency. This will continue with a collection of exceptional cooling options, including portable air conditioners and portable air coolers, that should prove to be invaluable this upcoming spring and summer. Honeywell Portable Air Conditioners display a high level of versatility and performance. These portable air conditioners chill the air while simultaneously performing as a dehumidifier. An easy installation process and the added ability to transfer your unit freely from one room to the next open a host of practical indoor applications. The addition of four caster wheels and the freedom to operate without a permanent installation encourages owners to be especially creative when it comes to utilizing their portable air conditioner. These units work exceptionally well inside of the household. Get the better of a hot and humid afternoon by transferring your unit from the kitchen to the living room. Entertaining a party of guests outdoors? Simply roll a Honeywell Outdoor Air Cooler to your desired location and enjoy a continuous stream of cool air. Whether you're searching for an air conditioner to satisfy your personal requirements or something that will benefit others, there's simply no shortage of options to explore. 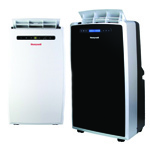 The Honeywell MM14CHCS Portable Air Conditioner and Heater combines 4-in-1 technology into one sleek body. Capable of cooling, heating and dehumidifying areas up to 550 square feet, this portable air conditioner can be used all year round. This makes it an ideal addition for keeping you cool during hot summers and warm during cold winters. Spring is nearly upon us and not long thereafter, we'll be waist deep in summer. Assure you and your family's comfort for the seasons ahead and purchase a Honeywell Portable Air Conditioner today!